Born as Curtis James Jackson III, 50 Cent lost his mother at a veryyoung age andnever knew his father either. Rather than relying upon others, he relied on himself and never backed down when life threw hardships at him. 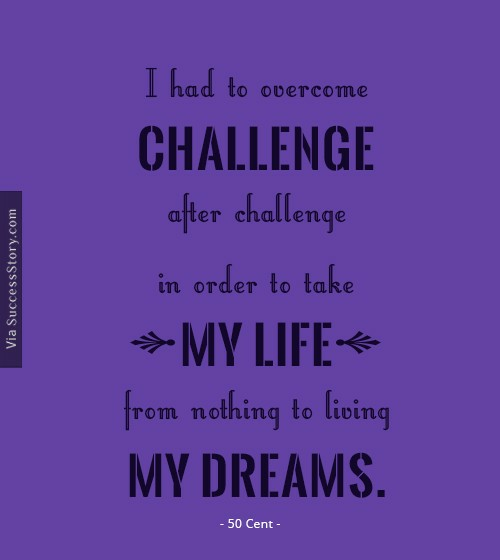 His life wasn’t easy and he did go through several rough patches, but 50 Cent, beat all odds and came out victorious. He has made a huge success out of his life and seeks after his fantasies with a mind-blowing measure of energy, making him a relentless power figure and a true inspiration. "I had to overcome challenge after challenge in order to take my life from nothing to living my dreams."